Another GIF, I love Masha’s ribbon ending pose in Happy Caravan Tashkent 2012, junior team competition, extract from Marc’s video I bought. I found Masha having good reaction of ending, she did well too in WC Kiev 2012. And this is the still photo of her ending in this competition, taken by Oleg Naumov!!! Ohh my, Masha is sooo lovely and sweeeet, she took a deep breath with her teammate Daria Svatkovskaya at the same time before Daria stepping on the carpet in Hoop final EC Vienna 2013 . Masha, you are such a pure girl, please don’t change! Four Banners a set by my friend Hershey, Many Many Thanks!!! Q: Last year the second spot for the Olympics was decided between Daria Dmitrieva and Alexandra Merkulova. Where are these girls now? Quiz game: guess! 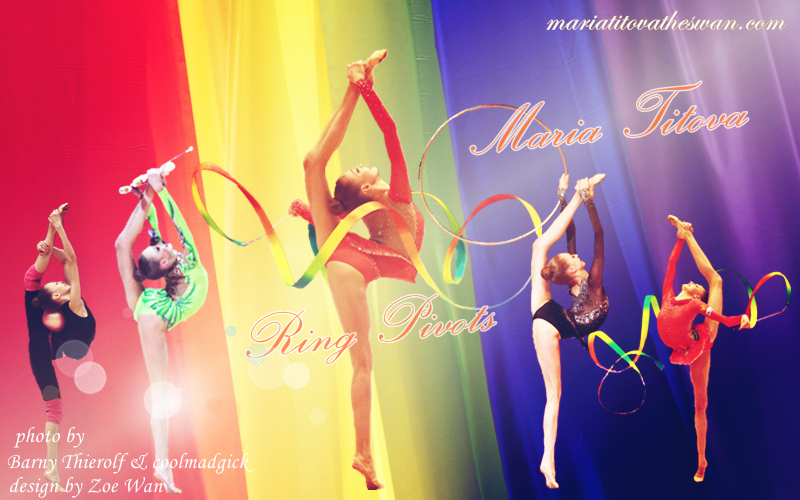 what is the color of Masha’s new ribbon routine leotard?